Tongue - Angiectasis in female B6C3F1 mouse from a chronic study. 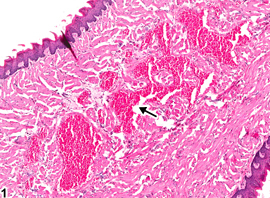 There are numerous dilated vascular spaces in the tongue (arrow). Tongue - Angiectasis in female B6C3F1 mouse from a chronic study. 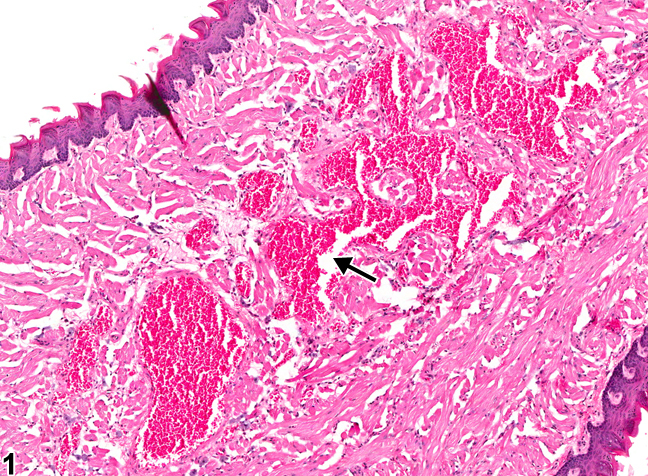 The dilated vascular spaces are lined by unremarkable endothelial cells (arrow). Vascular lesions of the tongue are rarely encountered in NTP studies. Angiectasis (vascular ectasia) is primarily a spontaneous age-related lesion. The cause is generally not known but occasionally can be a response to chemical injury. 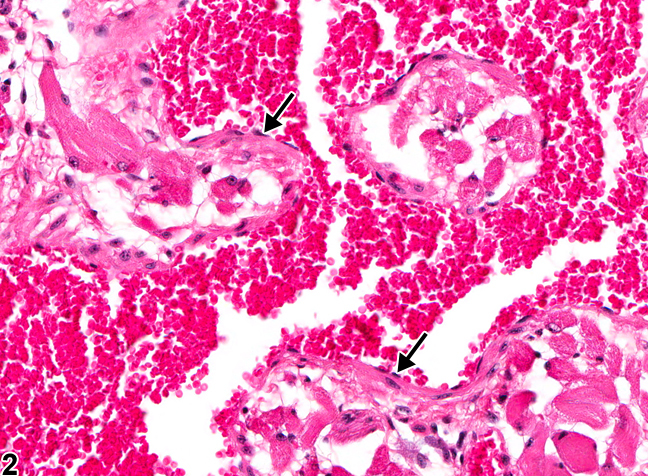 Angiectasis consists of widely dilated vascular spaces that are lined by unremarkable endothelial cells ( Figure 1 and Figure 2 ). There is no apparent increase in numbers of vessels, and the stroma of the organ is unaltered. Angiectasis should be distinguished from hemangioma, but the distinction often is not clear. Hemangiomas tend to be well-circumscribed unencapsulated masses composed of tightly packed dilated vascular spaces. Each vascular space is lined by a single layer of normal-appearing endothelial cells aligned on collagenous septa, which are usually thin, although some have broad collagenous stroma. 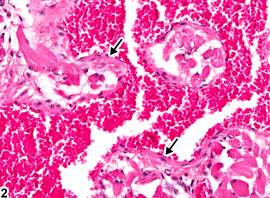 Angiectasis does not usually present as a well-circumscribed mass, as the dilated vascular channels often course irregularly through connective tissue. Angiectasis should be diagnosed whenever present and given a severity grade. Boorman GA, Everitt JI. 2006. Neoplastic diseases. In: The Laboratory Rat, 2nd ed (Suckow MA, Weisbroth SH, Franklin CL, eds). Elsevier Academic Press, Burlington, MA, 479-511.